The k4kur0 Midlet is a J2ME game providing Kakuro puzzles for Java enabled cell phones or other mobile devices (see the J2ME Device List. The game requires at least MIDP 1.0 and CLDC 1.0). The canonical Kakuro puzzle is played in a grid of filled and empty cells - "black" and "white", respectively - usually 16x16 in size, but these dimensions can vary widely. Apart from the top row and leftmost column - which are entirely black - the grid, just like a crossword, is divided into "entries" - orthogonal lines of white cells - by the black cells. The black cells themselves - possibly barring those in a cluster - are not entirely solid but rather contain a diagonal slash from upper-left to lower-right and a number in one or both halves, such that each horizontal entry has a number in the black half-cell to its immediate left and each vertical entry has a number in the black half-cell immediately above it. These numbers, continuing the borrowed crossword terminology, are commonly called "clues". The object of the puzzle is to insert a digit from 1 to 9 inclusive into each white cell such that the sum of the numbers in each entry matches the clue associated with it and that no digit is duplicated in any entry. It is that lack of duplication that makes creating Kakuro puzzles with unique solutions possible, and which means solving a Kakuro puzzle involves investigating combinations more, compared to Sudoku in which the focus is on permutations. "The mobile game offers you the Kakuro game experience. You can generate new games or input your own Kakuro puzzle. Games can be saved and continued. The midlet helps you to solve the puzzle: It provides pencil marks, checks your input, reveals single digits and displays the complete solution." The Midlet is Emailware developed by Ive&Marcus (Freeware with a request): If you use it, please pass a short note to . Resume command will switch to the game screen to continue your latest puzzle. Local library command can be used to Save, Load and Delete your games from the device storage. Reset game command will reset the current game to start all over. New Game command will create a new game with selected grid size. The grid size can be selected using the cursor keys. Input Game or Edit game allow you to enter the Edit Mode. In Edit Mode you can set up your own Kakuro and use Check and Solve&Play commands to check and solve it. If it is solvable you will get into Game Mode automatically, where you can play your own puzzle. In Edit mode, you can enter clue values and use the * key to set/remove clue positions. Preferences command will allow you to change various game settings or to Reset all preferences. Game settings allow you to control presets and behaviour of the game. You can indicate unique and erroneous sums to make the clues color to signal unique sum combinations or wrong sum values. You can reduce the sum values displayed as clues after input of digits in the respective row/column. You can select an alternative digit key navigation if your device has no cursor keys - you will need to press the 0-key before putting in a digit in game. You can disable the row/column size preset for new games (might help, if a puzzle to large for display has been selected and game does abort due to memory problems). You can change the download URL for the remote puzzle library. On Nokia devices you can select the background light level and prevent the light from switching off during gameplay. Colors Board and Colors Screen setting allows you to change various colors k4kur0 is using. Within the Color Selection use left/right to select a color and up/down to select a color component. Update the color component by typing in the new value or using left/right key. On Pointer devices, click on the colors and values to change them. Language enables you to switch the game-language. The new setting becomes active after restart. Help command accesses About, Rules, Game Keys and Input Keys information. Devices with pointer support also offer Pointer control information. Exit command will quit the midlet and Auto-Save the current game. The game will be restored upon restart of the midlet. This is the puzzle screen. Use the navigation keys of your mobile device to move the (yellow) cursor around. You can set and delete a digit by using your device's number pad. If your device offers pointer input, you can select a digit from the digit-bar and click on the cell to apply it to or delete it from. The clue cells are marked with bright color, if their sum can be build by only one combination (unique sum). If the entered row/colum values are not summing up to the given clue, the clue color will change to red. Use the # key to display and hide the game menu commands - on devices with pointer support click on the right arrow (twice) to show the menu. Switch between Pen and Pencil mode using the 0-key. In Pen Mode the digits are set via the number pad, in Pencil Mode tiny Pencil Marks are set. 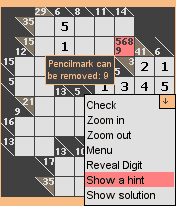 Pencil Marks are used to indicate possible digits for the current cell. If your device supports pointer input, you can also click on the pen icon to change the mode. You can check the current elapsed time for the active puzzle by using the * key while the cursor is on a clue field. (If you have a pointer device, you can click on the right arrow icon). A small info area will be displayed. Time accounting will stop as soon as the puzzle has been solved. While you are on the clue field, you can use the number pad to input digits to the mini-sum-calculator: The # key will delete input digits, the * key enter a plus/minus sign for the calculation. The game is displaying sum combinations for the current cell sums by using the * key while the cursor is on a digit field. The small info area will show the current horizontal and vertical sums together with the possible combinations. If there are to many combinations to be displayed, a + will indicate this. The combinations are reduced as soon as digits are entered within the sum row/column. Check command will check your input and indicate the cells with correct and wrong numbers. Zoom in and Zoom out commands will enlarge or reduce the font size of the game grid (4 sizes supported). On older devices and big grids, zooming in might result in an out of memory problem. Menu command leaves the game screen for the main menu. Reveal digit command will display the correct digit for the current cell. This is a hint feature. Show a hint command checks the game and also tries to give a proposal which cell can be solved. Show solution command will display the complete solution. Undo/Redo command will undo/redo the last action of the current game session. Info command shows a pop up with infos about the current game. Exit command will quit the midlet and Auto-Save the current game. Special Thanks to Nanami for Beta-Testing and Elmi for E61 Support. Das k4kur0 Midlet ist ein J2ME Spiel für Kakuro Puzzle für Handys oder andere mobile Geräte mit Java Unterstützung (siehe J2ME Device List. Das Spiel benötigt mindestens MIDP 1.0 und CLDC 1.0). Kakuro Puzzle werden auch Cross-Sums (Kreuz-summen) genannt. Auf einem Spielfeld werden schwarze Felder mit Vorgaben wie bei Kreuzworträtseln angezeigt. Diese Vorgaben enthalten Summenwerte. In den horizontalen und vertikalen Feldern müssen nun die Ziffern 1-9 so eingegeben werden, dass Ihre Summe der Vorgabe entspricht und dabei innerhalb einer Summe jede Ziffer nur maximal einmal vorkommt. Kakuros haben generell eine eindeutige Lösung. "Das k4kur0 Midlet ermöglicht das Lösen von Kakuro Rätseln für unterwegs. Man kann neue Puzzle erzeugen oder eigene eingeben. Spiele können gespeichert und fortgesetzt werden. Das Midlet hilft beim Lösen: Man kann Kandidaten eingeben, die Eingaben prüfen, einzelne Zahlen aufdecken oder die ganze Lösung anzeigen lassen." Das Midlet ist Email-ware erstellt von Ive&Marcus (Freeware mit einer Bitte): Wenn es Dir gefällt und Du es benutzt, schreibe doch eine kurze Email an . Weiter schaltet auf den Spielbildschrim, um das letzte Puzzle weiter zu spielen. Lokale Ablage kann genutzt werden, um Spiele auf dem Gerät zu Speichern, Laden und zu Löschen. Spiel zurücksetzen setzt das Puzzle auf Anfang zurück. Neues Spiel erzeugt ein neues Spiel mit der ausgewählten Spielfeldgrösse. Die Größe kann mit den Steuertasten eingestellt werden. Spiel eingeben und Spiel bearbeiten ermöglicht eigene Puzzle einzugeben. Im Eingabemodus kann man die Vorgabefelder mit Summenwerten erstellen und mit Prüfen und Löse&Spiele die Eingaben validieren. Ist das Spiel lösbar, kommt man in den Spielmodus, in welchem man das eigene Puzzle spielen kann. Im Eingabemodus werden Vorgabefelder mit * gesetzt oder gelöscht. Einstellungen gibt es für verschiedene Vorgaben. Mit Alles Zurücksetzen werden alle Einstellungen auf den Ausgangswert eingestellt. Spiel Einstellungen: Man kann eindeutige (nur eine Ziffernkombination) oder falsche eingegebene Summenwerte hervorheben. Man kann einstellen, dass sich die Summenvorgaben bei Ziffereingaben verringern. Ein alternativer Eingabemodus kann aktiviert werden, wenn das Gerät keine extra Navigationstasten hat - dann muss man vor Eingabe einer Ziffer im Spiel die Taste 0 drücken. Die Vorauswahl der Spiefeldgröße kann ausgeschaltete werden (falls hierdurch Memoryprobleme auftreten). Weiterhin kann die Download Adresse, von der die Internetspiele geladen werden, angepasst werden. Auf Nokia Telefonen kann noch die Helligkeit der Anzeige eingestellt werden. Farben Spielfeld und Farben Anzeige erlaubt das Ändern von verschiedenen k4kur0 Farben. In der Farbauswahl kann mit rechts/links Tasten ein Farbe und durch hoch/runter eine Farbkomponente ausgewählt werden. Durch Nummerneingabe oder mit den Tasten links/rechts kann dann der Farbwert angepassst werden. Sprache (Neustart) erlaubt es, zwischen verschiedenen Sprachen umzuschalten. Dazu muss dass Midlet neu gestartet werden. Hilfe zeigt Informationen zu Über k4kur0, Regeln, Spielsteuerung und Spielbearbeitung an. Geräte mit Zeigereingabe haben noch Informationen zur Zeigersteuerung. Beenden speichert das aktuelle Spiel (Auto-Save) und beendet das Midlet. Mit den Steuertasten kann der (gelbe) Cursor bewegt werden. Mit den Nummertasten gibt man die Ziffern ein. Unterstützt das Gerät Zeigereingaben wird eine Ziffernleiste angezeigt, auf der man die Nummern anklicken kann. Vorgabefelder werden hell markiert, wenn die Summen durch eine eindeutige Kombination von Ziffern gebildet werden können. Ergeben die eingegebenen Ziffern nicht die vorgegebenen Summen, werden diese rot eingefärbt. Mit der Taste # kann man das Spielmenü aufrufen. Mit der Taste 0 kann man in den Marker Modus wechseln. Im normalen Modus werden die Ziffern in die Felder gesetzt. Im Marker Modus werden mehrere kleinere Ziffern als mögliche Kandidaten eingetragen. Mit der * Taste wird der Hilfebereich angezeigt. Steht der Cursor auf einem Vorgabefeld, wird dort die Spielzeit angezeigt und man kann Eingaben in den Mini-Rechner vornehmen: Mit # werden die Eingaben gelöscht, mit * kann ein plus/minus in der Rechnung eingegeben werden. Steht der Cursor auf einem Ziffernfeld, zeigt der Hilfebereich alle möglichen Kombinationen für die entsprechenden Summen (horizontal/vertikal). Passen nicht alle Kombinationen in die Anzeige, weist ein + am Ende darauf hin. Die Kombinationen werden eingeschränkt, wenn bereits Felder in den Summen gefüllt sind. Prüfen validiert die Eingabe und zeigt richtig und falsch gefüllte Felder an. Vergrössern und Verkleinern passt die Zifferngröße an (4 Stufen). Auf älteren Geräten kann dies zu Speicherproblemen führen. Löse Feld zeigt die richtige Ziffer für das aktuelle Feld. Zeige Hinweis prüft das Spiel und versucht einen Vorschlag zu geben, welches Feld gelöst werden kann. Zeige Lösung zeigt die gesamte Lösung an. Wiederherst./Rückgängig verarbeitet die letzten Eingaben innerhalb der Spielsitzung. Info zeigt ein PopUp mit Informationen zum aktuellen Spiel. Beenden beendet das Midlet und speichert das aktuelle Spiel (Auto-Save). Vielen Dank an Nanami fürs Testen und Elmi für den E61 Support. The k4kur0 midlet is freeware (emailware). The k4kur0 midlet ("The software") can be distributed and/or published on the Internet. The software must remain free of charge and it is prohibited to request any donations for the software. The k4kur0 midlet source code and software is set under GPL License (see below).